LA QUINTA, Calif. - A gentle breeze drifts through the shutters of your casita, rousing you from a deep sleep. The bright sun is already well into erasing the remnants of last night's downpour, beckoning of all the possibilities that await. If every day could begin like this, what a sweet life it would be. Of course, that's probably why celebrities as far back as Greta Garbo, Clark Gable and Bette Davis frequented the La Quinta Resort and Club. 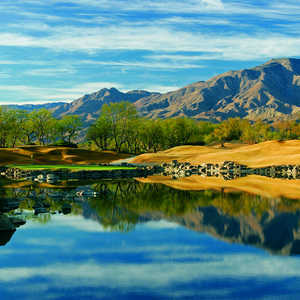 Even a movie star's life looks a little better under the natural light of the Palm Springs area's oldest golf resort. You pay for the privilege (over $400 per night usually, though there are sometimes "super saver" deals for around $200 per night). This price range should erase any lingering thought you'd had of linking this La Quinta with the budget hotel chain of the same name. This is a first-class resort, steeped in history and luxury amenities, the kind of place that regular folks dream about staying once or twice in their lives. For some, it's a once-in-a-blue-moon Palm Springs splurge. For many of the guests who stay here, however, price isn't an issue. It's more about quality. "No one comes to Palm Springs to save money,'' guest Lowell Hamilton explained lounging by one of La Quinta's 41 pools (that's right, 41 pools). "I'd rather stay somewhere I can feel comfortable." In case you're wondering if there really is a difference between a $150 Palm Springs hotel room and a $450 Palm Springs hotel room, the answer is a definite yes. La Quinta will wow even those used to the resort lifestyle. For this isn't your ordinary resort. La Quinta is to resorts what the Empire State Building is to skyscrapers. The 41 pools and 53 whirlpools give a good hint of the scope of the place. They give you a map at check-in that's bigger than what the folks at Avis hand you. This is a compound onto itself, stretching across 45 acres. There are 800 guest rooms spread out along the property. Most of the rooms are arranged in squares around a pool, so that every 20 rooms or so has its own large pool. The setup adds a sense of intimacy. It can be like you're at your own private resort. On this Friday night, a couple could be seen swimming at midnight, having waited out the rain. The casitas on the second level of these two-story square setups are even more private, complete with their own grand, wraparound patio balcony, locked to anyone else. Forget breakfast in bed. Breakfast in the sun of a 75-degree February day at your own patio balcony table is even sweeter. For the obscenely rich or famous, there are five gigantic suites so secluded that no one's going to stumble upon you without invitation. This includes the 2,000-square-foot, $3,330-per-night El Presidente, where Oprah Winfrey, Michael Jackson and David Beckman have stayed. Even Will Smith and Joe Montana opted to go a step down to the 1,680-square-foot, $2,300-per-night Arzner Suite. Of course, like every famous and average Joe who stays in these shrines to luxury, they still got their own 24-hour personal assistant. Yet even with all this Robin Leach "Lifestyles of the Rich and Famous," 1980s-level decadence, La Quinta is not one of those stuffy, stuck-up places that is bound to make someone earning five figures uncomfortable. The most happening spot on the resort's restaurant row on this Friday night was the comparatively-low-priced Adobe Grill. In this relaxed, low-key spot, a band of Australians drank the night away, inviting one and all to join in. People wore jeans (not just $300 designer jeans either), the bartender poured liberally, ESPN was on the TV and you could get a great-tasting Mexican salmon main course for about $20. Of course, there was a piano player who looked like a model entertaining the diners in AZUR, the most elegant restaurant at La Quinta. AZUR is an offspring of New York's legendary seafood restaurant Le Bernardin (but like most Gotham imports, it is actually more expensive than the original). Still, if you're looking for a seafood experience and you're not going to the Big Apple anytime soon, the background of chef Eric Wadlund makes this a pretty sure bet. There is also Morgan's steakhouse for the meat lovers. In fact, it is hard not to find whatever you are looking for on the resort grounds. Resorts love to claim that old "you'll never feel the need to leave the grounds" line. La Quinta actually comes close to delivering on it. There are a row of high-end shops in an outdoor-mall setting, a 23,000-square-foot-spa, 23 tennis courts (hard, clay or grass surfaced), an art museum and yes, a huge croquet lawn. You thought you were going to have to leave the grounds to get in your croquet, didn't you? The golf does require venturing from this green, orange-tree-filled oasis in the middle of the desert. Chances are the golfer will be itching to get out, popping awake before the gentle breeze even comes into play. When La Quinta opened in 1926, it was the first Palm Springs area resort to feature golf. Seventy-nine years later, it offers guests a Jack Nicklaus, a Greg Norman and three Pete Dye-designs, all within a short drive. So much for Oprah being the big name. 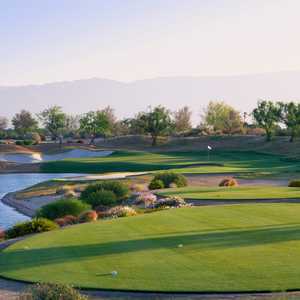 "You could stay in this little town of La Quinta for a week and just play golf,'' devoted hacker Nick Trefer said, between practice putts at the Greg Norman Course. "I wish I could afford to stay here for a week and just play." La Quinta has that kind of effect. No matter how long you're here, you're already wishing for more. Transitioning from your own private breakfast patio balcony to a studio apartment is no easy adjustment. Heck, an ordinary McMansion suddenly would appear lacking. This is the danger of La Quinta.